I decided to write few more words about Effortless English method and how I'm using it right now. I would like also to share with my couple ideas about learning english, because I think that they are quite good. Learning pharses helps you speak faster and learn more effective because you are always learning some parts of grammar rules studying and repeating whole phrases. I mean for example, I want to learn what does it mean "basket" I wrote some sentence like "I'm always taking my basket for shopping." by repeating such sentence you repeat some grammar and some other words. You don't waste your time! You remember better that such using Present Continuies can describe your habits etc. Don't repeat grammar rules all time, because you are not going to be fluent english speaker. Americans and British people didn't learn english grammar that way so why you are going to that. Use Point of View lessons which you can prepare yourself or you can ask your tutor to record them for you. How such lesson looks like? Imagine the same story written in different tenses, I mean Past, Present, Future then you just listen to that story many times not 3 or 4 times but 30 or 50 times. Repeat such story until your brain will feel the difference between Past, Present and Future. That's the power of repetition. I rememeber me listening to some of AJ's podcast 40 times, but then after 20 times I feel that I understand it better and faster. I started to thinking in english, I wasn't longer translating sentences and words from english to polish to catch the meaning. Learn by your ears not your eyes. Spend about 80% of your learning time for listening to understandable materials. I mean materials you understand in 80% and more. If you understand less you are not going to improve. That's why watching english movies and BBC is not effective because you don't understand enough to improve. If you are using materials which are too diificult for you, find some easier one like materials for kids. That's how you should listen, start from the easiest one and then move to more advanced when you will feel that you are ready. Remember about this 80% it's really important in learning by listening. The rest of your time you can of course spend reading books etc. That's exactly what I remind in point no 2. Repeat a lot, 2-3 times is not enough to learn and improve. Upload one or two mp3 lesson into your player and repeat them during next 2 weeks. Then you will feel how you are learning new vocabulary and what's the most important, you will use new vocabulary in real conversation automaticlly without thinking about it too much and without looking for it in your head. Just because you learned it deeply. Put away your textbooks, because english there is faked anyone is talking like that. Real people are using idioms, slang in casual conversation you are not going to understand them if you will learn still faked english. Find materials that are interesting for you. You must be exicted about learning english, not bored. I'm learning right now english learning something else. What does it mean? I'm learning PHP language (to create website) watching english video tutorials. I'm exicted about it because I like learning this stuff and I'm also happy because I'm still improving my english. That's my way. Ok, I think that I wrote quite enough about AJ Hoge's method. I hope you like my little review of Effortless English System. I really believe that he would, because in fact effortless english learning requires a lot of hard work and time. I must say that AJ and his method of teaching alternative look very interesting. I am learning with Effortless English now about 2 years. This is very powerful method and I have improved a lot. I can speak fast and without thinking about grammar rules - that was always my dream. 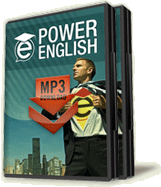 I'm planning to buy Power English course. Could you please let me know how much time should I allocate per day to listen to the course? i had power english course already. effortless english methods system is how much free time you have you should be listen and listen but you have to excite with your lesson and relax. 1-2 times per day is not enough to improve your english skill. early morning you listen 30 minutes- 1 hour , before have lunch you listen 30 minutes- 1 hour , before go to sleep you listen 30 minutes-1 hour for same lesson. you just keep doing like that until you understand more than 90% lesson then move to other lesson . That the best way to improve your english skill , you will improve quickly! I do learn with Effortless english methods for over two years and my language skills has improved dramaticaly. Nad thank you for the opportunity tu use the ChatRoom. I am going to try it from home since now I have problems with our company proxy server. Good luck all with your learning English! On the video lessons page the [Phrases Lesson Pt3] link is not correct. It points to the first Phrases lesson (Phrases Lesson Pt1). But your lessons are amazing. Thanks for pointing this :) I corrected this link, it works fine now. hi i'm glad to say that thank u a lot.but how can i download ur mp3 lessons??? I guess the Success_Story.mp3 link points to the same link named Cool_Stuff_2008.mp3 could you fix this soon? Thanks in advanced. I'm so glad to found your site. It's really useful for me. Godspeed! i have been using effortless english lesson for two days only...but my improvement is very fast..i can speak like a native speaker,,WOW...this might sound far fetched but it is happening..i think AJ put some magic to his lesson,i never thought i would learn super fast like this,it's a magic method..even AJ would not believe how fast i'm improving....i'm sure when i finish learning english with this method i will be able to speak better than native speakers...better than even AJ himself.. I have been listening to effortless english for a month and the result is fantastic .Thanks for the all hard work .All the best. Hi, effortless English Is a saver ,I am an English student but I had a difficulty in speaking .This cause a lack of confident and I did not participate in any kind of English conversations with my friends or anybody else. After I followed A .J. advices the result now is great. Thanks a lot. I really want to be good at English for the Palestinian cause .To show the world that the Palestinian cause is fair and TO SUPPORT IT . I am writing to you regarding your webenar. I want to thank you very much, because you share and give us the opportunity to increase ourselves' performances. I really want to thank you for your powerful and useful lessons. Thank you so much AJ! i really like your all your posts but i don know why i still cannot speak well. whenever i do presentation i still scare and i cannot speak it out i forgot everthing.. do you have any sugguest ? I am using the effortless system for 6 weeks now and I really like it. Thank you very much for creating this method, it helps me a lot. It is worth every cent i paid for it.It's so much different from all the other methods I tried. It is fun and it motivates me. I also got an audio-recorder program on my computer and so when I'm listening to the mini-story i can record myself answering the questions and check my pronunciation afterwards. Recording yourself to check your pronunciation is great idea. Good luck! Aj, iam on you side! Lets change the Wold! hi Aj u r an amazing coaches for english learning and i learnt alot with ur method of learning english. power english lessons are the best!!! Hi Aj, You are very good teacher! I feel great to know you. I will getting your lessons soon. The best teacher i ever found in the internet. You have a great ideas. You know how to teach to the foreign people and teaching the right way. Awesome guy, i wish you get more success in future. Thanks man! Hi AJ , I am very pleased to learn from your teaching methods that you are giving to the people all around the world to learn and practised English to be easier. I cam from Shan State, Myanmar, I have been studying, practising the English Language since-2007, until now. I can speak easyily to others that's because I had learn different from teachers with various methods in kinds of practise the English language. Your tactic also very Excellent to stimulate me to talk in English with my friends. Hopefully to get the good tactic points of ways to prastise the English from you ! for me i just see the website yesterday and i find it very very good to improve English skill Saddam, Yemen. HI A.J. i'd like to say thank you by your lessons. I advanced too much in 2 months hearing you twice a day. Your method is the most efficient that i met up today. In paralel I study E.F.idioms from my company, but does not have comparison with your method. You are the best. Is this metod realy works ? I am an English teacher online and we'd say 'does this method really work'? Hope that helps. All the best. AJ's method worked for me. I'm a VIP member for just over a month and I noticed a significant improvement already. Specifically, my confidence in English speaking did improve dramatically. I still make mistakes everytime i talk and I think this is just normal. I'm surprised with all the ideas in the podcast and i think they are more worthwhile than learning the English language itself. The English speaking part is just bonus. Hi Tiffany , how are you ? You and Aj are doing such a great job , congratulations ! I'am improving every day my english speaking , now I am at the level 3 of original effortles English and I am so exciting for that . But its one problem because I got these lessons for free and for that reason I don't feel really confortabile . I just want to now is this causes a problem for your family because I didn't give you money for your effortles english lessons . I need an answer from you or Aj to continue that what I am doing ? P.s I got those lessons since 2012 , in the end of 2012 ! When I finished this lessons I will give your money , I promise . Please answer to me !! ? ? I KNOW SEVeral METHODES BUT THIS IS THE BEST TOO FAR!!!!!!!!!!!! it's the most incredible magic way to improve English skills. hi AJ i would like to thank you a lot for your creative method. i began listening to your lessons two month ago but i wanna ask how often should i repeat every lesson? I'm planning to buy this course. Could anyone please let me know how much time do I need per day for listening to the courses?